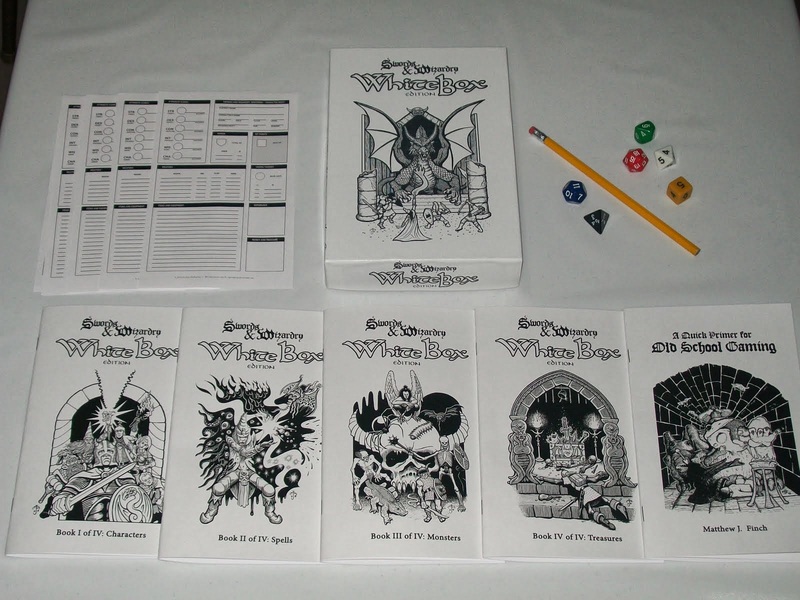 I thought that I would mention that Brave Halfling Games is having a sale on box sets of the third printing of the 'White Box' version of the Swords & Wizardry RPG (the 'retro-clone' of '0e D&D'). THIRD PRINT EDITION – November 25, 2010. Prepare to be introduced to the old style of free form gaming! 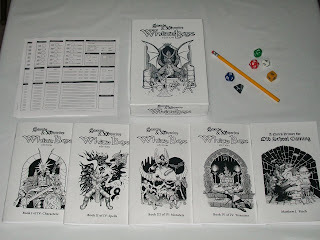 Swords & Wizardry: WhiteBox is inspired by the original 1974 fantasy role-playing game created by Gary Gygax and Dave Arneson. These rules are flexible and open to interpretation – designed not to cover all conceivable situations, but to allow good Referees and Players the freedom to create and play games of their own design. I already own a copy of this box set, but I'm tempted to get a second one, given the low price and the fact that the third printing fixes a number of minor typos and mistakes in the earlier printings (I'm somewhat uptight about such things). 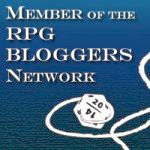 If you look under the ‘Classic D&D links’ on the right side of this blog, you will see a link to a company called ‘Northwind Adventures.’ This company has only one product available so far, ‘The Charnel Crypt of the Sightless Serpent’ (a very fine adventure, as I note here). However, it seems that their rules and setting book, “Astonishing Swordsmen & Sorcerers of Hyperborea,” will be available in early 2011. 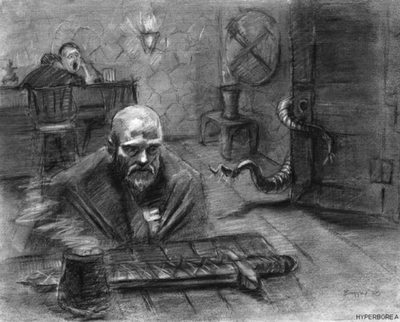 What is Astonishing Swordsmen & Sorcerers of Hyperborea? Astonishing Swordsmen & Sorcerers of Hyperborea is a role-playing game designed by Jeffrey Talanian and illustrated by Ian Baggley. 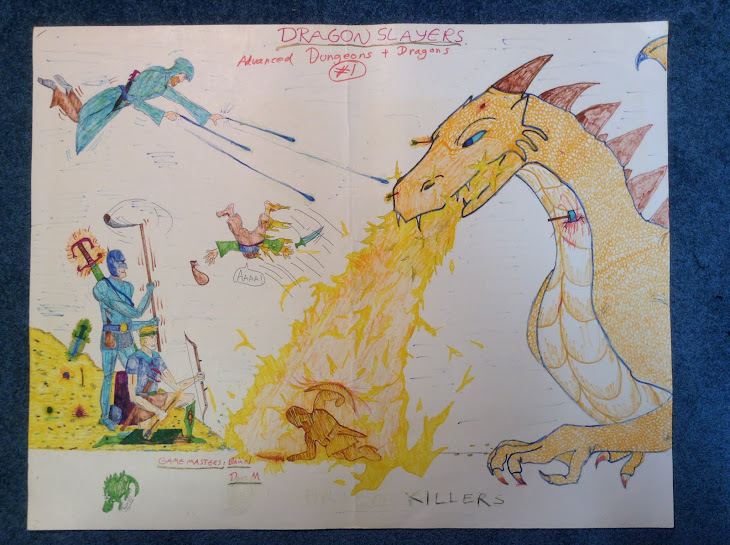 The rules are derived from the works of Gary Gygax and David Arneson. The setting is inspired by the pulp fiction of Robert Ervin Howard, Howard Phillip Lovecraft, Clark Ashton Smith, and others. AS&SH might be classified as a “simulacrum” or “retro-clone” game, but it does not “clone” any specific rules system. While some retro-clones seek to emulate specific traditional systems as closely as possible, AS&SH takes its inspiration from a variety of 0e and 1e related sources; also it is interwoven with its own alternative procedures. Hyperborea the campaign setting is brimming with locations filled with adventure, conflict, weird horror, and intrigue. It comprises environs, cities, men, and monsters inspired by pulp fiction and mythological resources, but also a mix of traditional RPG monsters hand-picked to best fit the milieu; consequently, describing Hyperborea as “pastiche” might not be inaccurate. Attributes: Strength, Dexterity, Constitution, Intelligence, Wisdom, Charisma. These attributes are generated using one of five different methods. While attributes can modify a character’s capabilities, these are handled on a flat progression curve. Example: A 16 strength provides +1 “to hit” and +1 damage, 17 strength provides +1/+2, and 18 strength provides +2/+2. On the whole, AS&SH takes a minimalistic approach for handling modifiers to rolls. Classes: There are four principal character classes. • Fighter: a swordsman, bowman, or other warrior type. • Magician: a sorcerer who studies magical tomes and casts spells. • Cleric: an armed and armoured fighting sorcerer of mystical nature. • Thief: a nimble swordsman possessed of numerous specialty skills. Subclasses: There are eighteen subclasses. • Barbarian: an outland warrior possessed of feral reflexes and instincts. • Berserker: a rampaging shock trooper renowned for his unbridled battle rage. • Cataphract (Knight): a mail clad horseman and warrior elite. • Paladin: a champion who crusades for Law. • Ranger: a righteous borderland fighter and wilderness warrior. • Warlock: a mail clad fighter who wields steel and sorcery interchangeably. • Illusionist: a sorcerer who manipulates light and evokes illusions and phantasms. • Necromancer: a sorcerer who practices black magic and communicates with the dead. • Pyromancer: a sorcerer who manipulates the elemental power of fire. • Witch: a sorceress who brews potions, divines portents, and lays curses. • Druid: a mystic sorcerer empowered by ancestral, elemental, and animistic spirits. • Monk: a warrior-priest who strives for physical and mental mastery. • Priest: a chaplain mystic sorcerer of enhanced spell casting capacity. • Shaman (Witch Doctor): a primal sorcerer who divines portents and confers with spirits. • Assassin: a thief who specializes in murder and intrigue. • Bard (Skald): a versatile warrior, scholar, sorcerer and word weaver. • Legerdemainist: an adept thief who also commands the power of sorcery. • Scout: a lightly armed explorer, intelligence gatherer, and stealth master. Alignment: Alignment is governed by the opposing forces of Law (Civilization) and Chaos (Barbarism). Law and Chaos are subdivided by the ethos of Good and Evil. Thus the four alignments of Lawful Good, Lawful Evil, Chaotic Good, and Chaotic Evil define the world view of most intelligent beings, whilst Neutrality forms a nexus of behavioural indifference. Weapon Skills: Any AS&SH character can use any weapon. However, several classes begin with a favoured weapon list. Learning a weapon that is not on the favoured list may occur at specific level gains. For instance, your low level magician may begin play with dagger, dart, and quarterstaff familiarity, but should he wish to take up the long sword in the future, he may well do so. Fighters and fighter subclasses have weapon mastery, which means they enjoy a +1 “to hit” and +1 damage bonus with player chosen weapons, and also an increased rate of attack. Armour and Weapons: Includes 10 armour types that are broadly classified in groups of light, medium, and heavy. Medium and heavy armour types provide damage reduction. There are 35 melee weapons and 12 missile weapons from which to choose. Each melee weapon is assigned a “weapon class” which may determine first strike when melee is first engaged; e.g. a long spear wielder (WC 5) will beat short sword wielder (WC 1) when two such combatants first clash. Sorcery: AS&SH features over 400 spells presented in six spell levels. There are six spell casting schools, including magician, cleric, druid, illusionist, necromancer, pyromancer, and witch. Other spell casting types draw from these lists. For example, the bard draws from the druid and illusionist lists. Task Resolution: Many character classes have special class abilities that are resolved, for example, by using a d6, a d12, or some other resolution method. For actions not specifically covered by the rules, two different resolution methods are presented: a d6 method in which the referee determines a probability of success (1:6, 2:6, etc. ); and an attribute check method in which the attempted action is associated with a specific attribute: 3d6 for a moderate difficulty check, 4d6 for a heroic check, 5d6 for a super-heroic check in which the player must roll at or under the associated attribute. Time and Movement: Rounds = 10 seconds. Turns = 10 minutes. Movement rules are included for land and sea travel. Combat: An attack matrix is referenced to determine what AC the modified d20 attack roll hits. The combat sequence features an innovative 5-step phase sequence that covers movement, melee attacks, missile attacks, and magic. At each phase, each side in the battle takes turns, though combat movement is simultaneous, which is to say two respective closing sides will meet in the middle before engaging one another. There are 21 different combat actions presented. A few require mastery in a specific weapon, some are available only to fighter types, though most others can be attempted by any character. Combat actions include arrow setting, charging throw, disarm, dodge, double arrow shot, firing march, indirect fire, off-hand weapon parry, parry & block, pike hedge, pommel strike, ready shooter, reckless fighting/conservative fighting, recumbent fire, running dodge, saddle fire, shield bind, shield cover for ally, shield wall, spear charge, and two-weapon fighting. An optional critical hit system presented. It is simple and intuitive. It does not, for example, allow a magician to “crit” as well as the fighter can; i.e. fighters, upon rolling a natural 20 have a greater probability of delivering a larger amount of bonus damage. Saving Throws: There are five different saving throw categories. Each character has a base saving throw determined by character level. Each character class (fighter, magician, etc.) has modifiers to two of the five saving throw categories. Attributes can also modify some saving throws. For example, Death is a saving throw category that includes death ray, death magic, paralysis, poison, and radiation. A high constitution score can provide a bonus to poison and radiation saves, but not all death saves, per se. Other Combat: Other combat types include aerial combat, underwater combat, naval combat, and warfare & siege. 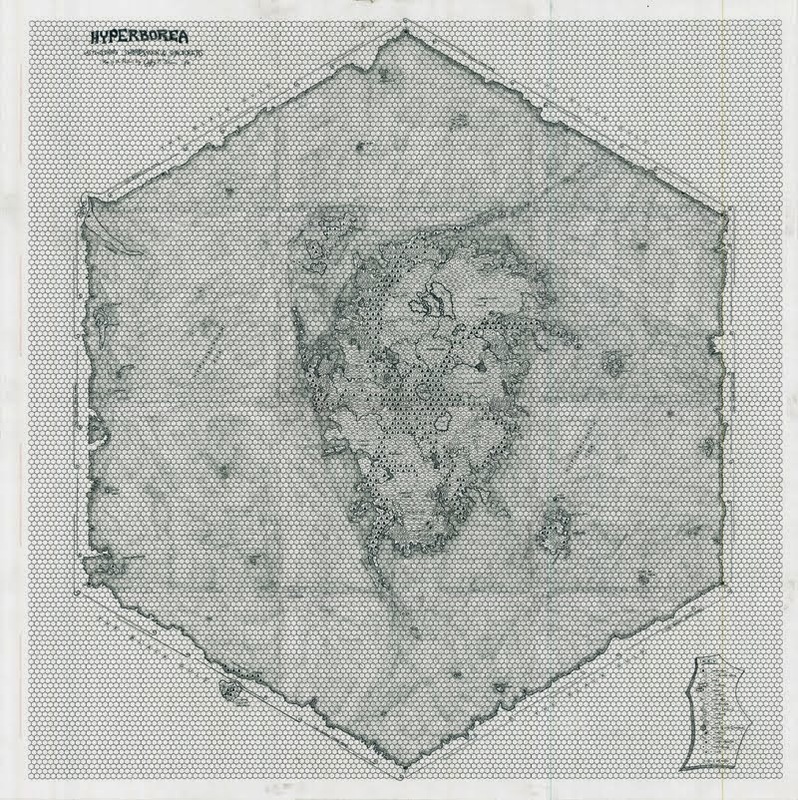 The Hyperborea Campaign Setting: The setting is treated in full, though brevity is paramount; this intended to provide the referee with digestible chunks of information and leaving plenty of room for individual development. That is to say, it is my belief that a campaign setting should not be the game designer’s attempt to satisfy the urge to write a fantasy novel. The Hyperborea setting includes a brief history, calendar, physical geography, position in the heavens, climate & seasons, and population examination. Hyperborea is a hexagonal shaped flat-earth campaign setting with a diameter of about 3,200 miles. It is hemmed in by the boreas (North Wind) beyond which lies the illimitable Black Gulf (space). 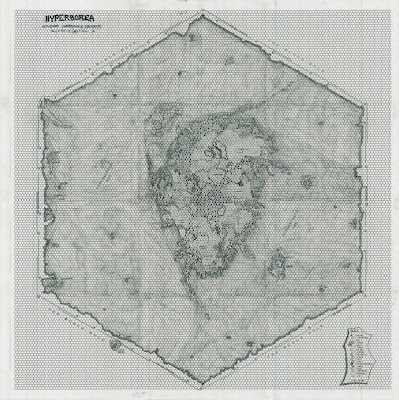 The map for Hyperborea is a large, hex based (each hex = 24 miles) affair developed by cartographer Andreas Claren. There are nine races of men. These are Common (men of mixed ancestry), Amazon, Atlantean, Esquimaux, Hyperborean, Ixian, Kelt, Kimmerian, Pict, and Viking. The deities of Hyperborea are a non-pantheon mix of otherworldly beings that include Apep, Apollo, Artemis, Aurorus, Boreas, Helios, Kraken, Krimmr, Kthulhu, Lunnaqqua, Mordezzan, Rel, Thaumagorga, Tlakk-Nakka, Ullr, Xathhoqqua, Yikkorth, Ymir, Yoon’Deh, Ythaqqa, and Yug. Bestiary: Nearly 200 monsters are included, these inspired by the pulp fiction creations of noted authors as well as a liberal selection of traditional RPG monsters hand-picked to best fit this sword-and-sorcery milieu. Magic & Treasure: A listing of magic weapons and items that might be found in the course of adventuring, including some displaced high-tech items such as ray guns, etc. Final Word: AS&SH draws close to completion, and should see publication by early 2011. The preceding information does not cover the entire scope of the rules and setting. I have tried to touch on some of the points that may be of interest to the reader. I am willing to answer questions on any of the above, including that which may have been excluded in this summary. As the final beta is soon to go out to my readers and idea contributors, some of the preceding may be altered before final publication. As I continue to gather printer quotes (admittedly, an exercise in frustration), the final physical format is not yet set in stone. I prefer a boxed set over a hardcover (with map insert), but there is much to consider. A final decision should be made by the end of 2010. Although I’m not really in the market for yet another FRPG based on D&D/AD&D – I already own all of the original games, most of the ‘retro-clones,’ and, in any case, am feeling somewhat ‘burnt out’ with such systems these days – I have to say that this variant looks quite intriguing. Talanian (a.k.a. ‘Ghul’) worked with Gary Gygax on the two best ‘Castle Zagyg’ products: Castle Zagyg: The East Mark Gazetteer, and Castle Zagyg: The Upper Works. So he certainly has excellent ‘old school’ credentials. I look forward to reading his vision of ‘swords & sorcery’ fantasy! And the art by (fellow Torontonian) Ian Baggley looks simply stunning – as the picture at the top of this post attests.